Adventures in the Endless Pursuit of Entertainment: With her debut album on the way, Kate Baldwin is our "Darling of the Day"
With her debut album on the way, Kate Baldwin is our "Darling of the Day"
My friend Kate Baldwin begins recording her debut album for PS Classics today! Kate is recording an album of tunes by composer/lyricist Burton Lane and lyricist E. Y. "Yip" Harburg, masters, both individually and together, of some of the most romantic of the American songbook. Although a song list has not been released, she told me that she plans to include That Something Extra Special, a gorgeous gem from Yip Harburg and Jule Styne's 1968 Darling of the Day that won Patricia Routledge a Tony for Best Leading Actress in a Musical. Darling of the Day is a brilliant flop that only ran for 31 performances. 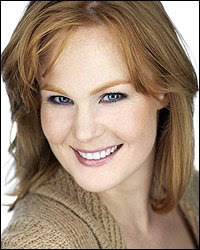 Earlier this year, we had the pleasure of finally seeing Kate star in a New York show when she opened as Sharon in Finian's Rainbow at Encores! at City Center. Kate showed us that she possesses old fashioned vocal sensibility of the classic book musical mixed with a fresh, unique sparkle that we rarely see on Broadway in these days of pop and jukebox musicals. Of course, I've known this since I first saw her in Opening Doors, a revue celebrating Sondheim at Zankel Hall. This summer, Kate takes her magic to The Muny in St. Louis, where she will star as Marian the Librarian in The Music Man. Even more exciting, she will once again star in Finian's Rainbow here in New York, this time a full production at the St. James Theatre on Broadway! Group tickets are already on sale at Telecharge for a planned first preview of August 24th. She's been on Broadway before (The Full Monty, Thoroughly Modern Millie and Wonderful Town - yes folks, she's a triple threat), but this time she'll rightly join the ranks of leading lady. In March, PS Classics digitally released Alphabet City Cycle, a five song cycle by composer Georgia Stitt and lyricist Marcy Heisler featuring Kate on vocals. In this work, Kate's versatility is highlighted - she can belt it out and then hold back so tenderly that you feel every emotion of the lyric. I am so thrilled that soon I will have another souvenir of her glorious voice, this time in my most favorite listening pastime of songs from book musicals and the American songbook. Yay! Love her. She's also fab as the mistress in the PBS broadcast of "Passion" with LuPone, where she replaced Benanti at the last min. You can see in her costume that she has a tatoo on her arm. Bravo! I loved her so much in ALNM. There's that rehearsal clip with Kate and Cheyenne on Broadway.com that I've been watching over and over again just to hear her voice. Ooooh... sooo good!! !